MULCH AND PREEN TOGETHER PROVIDE A ONE-TWO PUNCH AGAINST WEEDS. Everyone knows what mulch is. But, how many of you are familiar with the product PREEN? 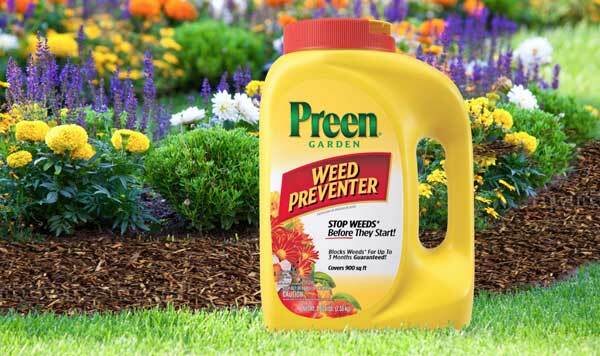 PREEN is a pre-emergent weed preventer that creates a weed-prevention barrier in the top layer of soil and mulch. Preen will NOT kill weeds that have already sprouted. A resounding YES! If you are like me then you get frustrated and tired of seeing weeds growing in your landscape beds. Bottom line – I am only going to do so much weed pulling by hand. There is no question that mulch is the first line of defense against weeds. It is now mid-March and this is a perfect time to be applying some fresh mulch to the beds. Keep in mind that you only need two or three inches of mulch at any one time. Any more than three inches and you are only wasting your money. 4 bags for $14.00 – BEST PRICE IN TOWN!!!!! RAKE – Get the rake out and start raking these landscape beds. Clean out these garden beds in order to start with a nice, clean slate. WET PAPER – Before applying mulch consider laying down some wet newspaper over the beds and around plants. The newspaper will eventually decompose but first will create a natural weed barrier and work hand-in-hand with mulch and Preen in preventing weed growth. MULCH – Next step is to apply a fresh layer of mulch. Mulch is a protective material placed over the soil. It helps retain moisture, keeps soil and plant roots cooler, will break down into the valuable organic matter over time and will deter some weeds while making your garden beds look nice and tidy. There are many types of mulch. It is a personal preference as to whether you choose hardwood, pine, cedar, pine needles, or wood chips. It doesn’t matter because they all serve the same purposes. PREEN – You sprinkle Preen on top of the mulch in order to create this weed barrier. As with any gardening product, it’s important to read the product label and follow instructions. Most gardeners apply their first application of Preen right now. Unfortunately, there are some winter weeds already sprouting and growing such as henbit, bittercress, and others that Preen will not kill. But, more weeds are coming. A second application of Preen should be applied there months later in order to help prevent later sprouting weeds from developing. PREEN DOES NOT HARM SHALLOW-ROOTED PERENNIALS OR BULBS FROM GROWING! Once Preen is applied I suggest that you don’t do too much walking or cultivating in the beds because you can “break” up this barrier which will then allow weeds to sprout and grow. Thank you — LOVING these ‘calendar reminders’ of what the heck we’re supposed to do in the garden. By the time I usually think about Preen — weeds are up and we’re fully into Spring. Please keep doing this! 🙂 HUGELY helpful.